Like Papyrus, Sans is also a monster. He has a body of skeleton with a dimpled face skull. How cute. 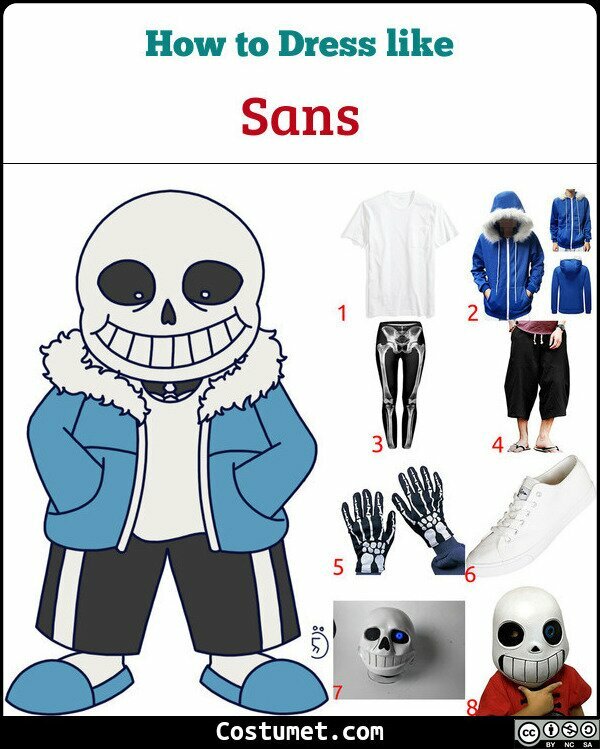 Sans wears a white T-short topped with a blue hooded jacket, baggy black pants, and gray shoes. Does Sans' look interest you? Check out our item list down below to see what do you need to dress as him! 1 White T-Shirt Just get a plain white T-shirt to wear. 2 Blue Jacket with Fury Hood Top a T-shirt with a blue jacket with fury hood. 3 Skeleton Leggings Look for a pair of skeleton leggings to wear. 4 Baggy Black Pants Get a pair of baggy black pants to wear over your leggings. 5 Skeleton Gloves Put on a pair of skeleton printed gloves. 6 White Sneakers Match your outfit with a pair of white shoes. 7 Skull Mask Get Sans skull mask to wear as a prop. This one looks very realistic and has a blue light in one eye. 8 Skull Mask 2 If the realistic one is over the budget, check this one out instead. Sans is one of major characters in a 2015 role-playing video game called "Undertale", which is the game about the world of monsters under the surface of the earth after they lost the war against human. Sans has a brother named Papyrus, who often reprimands him for being lazy but actually cares a lot about him. Both of them work as a sentry. Unlike his hard working and active brother, Sans is very laid back to the point of laziness. Though his personality makes him mostly apathy to anything around him, Sans could surprisingly get serious for some occasions. Sans is able to quickly travel or teleport using what he calls "shortcuts."